Patients with osteoporosis are prone to compression fractures in the spine bones, or vertebrae. The front of a vertebra cracks under pressure, causing it to collapse in height. More than 700,000 such fractures occur every year in the United States. These fractures often cause poor back posture, debilitating pain, and difficulty completing routine activities. 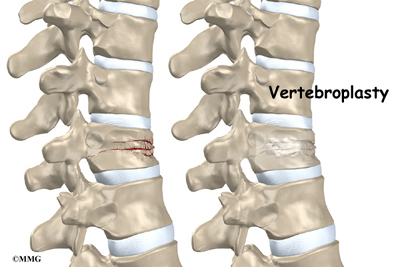 Vertebroplasty restores the strength of the fractured bone, thereby reducing pain. More than 80 percent of patients get immediate relief of pain with this procedure. The main section of each spine vertebra is a large, round block of bone called a vertebral body. Compression fractures cause this section of bone to collapse. The collapsed vertebra gives the spine a hunched appearance, called kyphosis, and the loss of vertebral height shortens the muscles on each side of the spine. This forces the back muscles to work harder, causing muscle fatigue and pain. 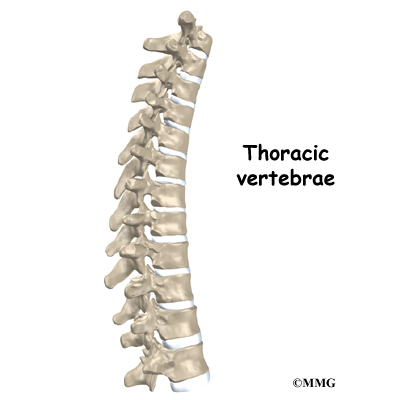 The vertebral body is the main structure treated in the vertebroplasty procedure. In the past, surgeons used standard open surgery to fix compression fractures from osteoporosis. Open surgery requires larger incisions to give the surgeon more room to operate. The results of open surgery for this condition have generally been poor, mainly because it is difficult to do surgery on bones that are weak and soft from osteoporosis. In addition, some aging adults with fractures may not be physically able to tolerate such surgery. Vertebroplasty gives surgeons a way to fix the broken bone without the problems associated with open surgery. Unlike open surgery, vertebroplasty is a minimally invasive procedure. It requires small openings in the skin and small instruments. This lessens the chance of bleeding, infection, and injury to muscles and tissues. Surgeons fix the bone in place by squeezing special cement into the broken bone. The cement strengthens and stiffens the vertebra, which reduces pain considerably and helps the patient return to normal activities. This procedure doesn't restore the original height of the broken vertebra, however. Nor does it prevent the kyphosis (hunchback) deformity that sometimes results from compression fractures. The decision to proceed with vertebroplasty must be made jointly by you and your surgeon. You should understand as much about the procedure as possible. If you have concerns or questions, talk to your surgeon. Vertebroplasty is normally done on an outpatient basis, meaning patients go home the same day as the surgery. You shouldn't eat or drink anything after midnight the night before. The patient lies on his or her stomach. To begin, the surgeon cleans the skin on the back with an antiseptic. Then the skin and muscles over the problem area are numbed using an anesthetic. Patients may also receive general anesthesia to put them to sleep during the procedure. A small incision is made in the skin on each side of the spinal column. A long needle is inserted through each opening. The surgeon slides the needles through the back of the spinal column into the fractured vertebral body. A fluoroscope is used to guide the needles. This is a special X-ray television camera adjusted above the patient's back that lets the surgeon see the patient's spine on a screen. Metal objects show up clearly on X-rays. The needles are easy for the surgeon to see on the fluoroscope screen. This helps the surgeon confirm that the needles reach the correct spot. Once the needle is in place, special bone cement, called polymethylmethacrylate (PMMA), is injected through the needle into the fractured vertebra. A chemical reaction in the cement causes it to harden in about 15 minutes. This fixes the bone so it can heal. Bandages are placed over the small openings where the needles were inserted. Infection following spine procedures is rare but can be a very serious complication. Some infections may show up early, within the first few days after the procedure. Infections on the skin's surface usually go away with antibiotics. Deeper infections that spread into the bones and soft tissues of the spine are harder to treat. They may require surgery to treat the infected portion of the spine. The cement used in vertebroplasty is in a liquid form and is squeezed into the fractured vertebra under high pressure. Some of the cement commonly leaks out of the vertebra, but this usually doesn't cause any problems. Only rarely does a cement leak cause pressure on the spinal cord or nearby nerves. In these cases, surgery may be required to remove the pressure. Many patients get nearly complete relief of symptoms from vertebroplasty. As with any procedure, however, you should expect some pain afterward. If the pain continues or becomes unbearable, talk to your doctor about treatments that can help control your pain. Patients are monitored in the recovery room for two to three hours after the procedure before going home. Patients are instructed to move their backs only carefully and comfortably. Some patients who feel extra pain or other problems after the procedure may need to stay in the hospital overnight. Patients rarely need to wear a brace after vertebroplasty, since bone cement immediately improves the strength and stiffness of the fractured vertebra. People often report greater ease with daily activities within a week after vertebroplasty. Pain also decreases rapidly, and most people require less pain medication within two weeks. Despite these quick improvements, most orthopedists consider that it takes about three months for the bone to heal after vertebroplasty. Patients are encouraged to walk and do moderate activity as they recover. However, patients should avoid strenuous activity until the surgeon approves it. When the fracture is from osteoporosis, the surgeon will suggest ways to prevent future problems. Patients may be prescribed medications and supplements (calcium and vitamin D) to maximize bone health. Lifestyle changes, such as quitting smoking and taking up exercising, may also be discussed. Patients who continue to have pain or who have lost muscle tone and strength may need the help of a physical therapist. These patients typically attend therapy sessions for four to six weeks. The goal of therapy is to safely advance strength and function. The therapist may use treatments such as heat or ice, electrical stimulation, or massage to calm pain. Gentle exercise improves the strength of the spine and limbs. Patients learn how to move safely using healthy postures to reduce strain on the healing back. Exercises for the heart and lungs improve stamina and help with pain control. As the therapy sessions come to an end, the therapist helps patients get back to the activities they enjoy. Ideally, patients are able to resume normal activities. They may be counseled on which activities are safe or how to change the way they go about their activities. When treatment is well under way, regular visits to the therapist's office end. The therapist continues to be a resource. 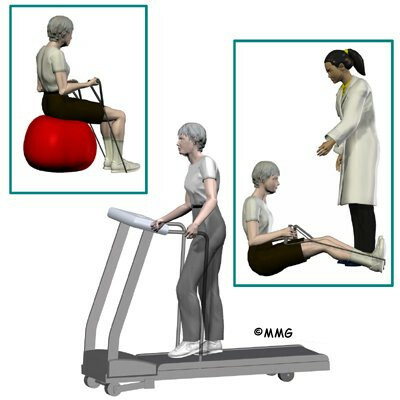 But patients are in charge of doing their exercises as part of an ongoing home program.